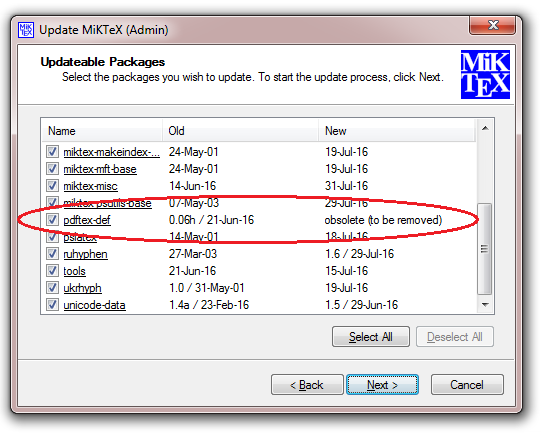 When I updated MikTeX through the automatic update program, I could not compile afterwards. It could not find pdftex-def. I then uninstalled MiKTeX and reinstalled it again. Now it is working again. If I run the update program again, I can see that pdftex-def is obsolete and will be removed. Is that was caused the problem in the first place? Is this a bug? A clean install of MiKTeX solved the problem. Now I can run the automatic update via MiKTeX which automatic remove pdftex-deffrom MikTeX, without any problems. Edit: as pointed out by Ulrike Fischer, I did not need to make a clean install of MikTeX, just find the missing package and install that in the package manager. Not the answer you're looking for? Browse other questions tagged pdftex compiling updating update or ask your own question.